With tensions rising, Hawaii lawmakers are revisiting the state’s emergency plans in case of an attack on the island state. The plans were last reviewed in the 1980s. But the Hawaii House Public Safety Committee on Thursday formally called for the state’s defense agency to repair their hundreds of Cold War-era fallout shelters and restock them with medical supplies, food and water. While the threats and displays of weapons capability in Pyongyang are playing out on the other side of the world for most Americans, Hawaii residents – some old enough to remember the last time their home was at the frontlines – see the dispute much differently. Honolulu is roughly 4,600 miles from the North Korean capital of Pyongyang. 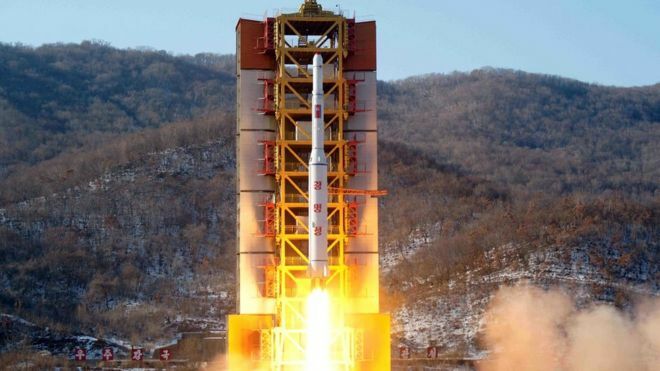 A North Korean missile launched Sunday to showcase the country’s nuclear and missile capabilities in honor of the birthday of its late founder failed just seconds after launch. Although, satellite images show a sixth nuclear test has been readied. And experts have said North Korea is on the brink of possessing the capability to launch intercontinental ballistic missiles or nuclear warheads at Hawaii. A long-range missile launched from North Korea could reach Hawaii or Alaska, said Dean Cheng, senior research fellow with the Asian Studies Center at the conservative Heritage Foundation. Hawaii is possibly a more desirable target, Cheng said, since the state has 11 military bases, including Pearl Harbor, and is the headquarters for the United States Pacific Command (USPACOM) at Camp Smith. Cheng warned that since North Korea likely has an inaccurate system, missiles launched at Pearl Harbor have the possibility of striking downtown Honolulu or other areas of Oahu. The impact of a missile hitting the island chain would be horrific, Cheng said. Burn cases would overwhelm the hospitals. The state would need a plan to treat people out of the urban Honolulu center, he said, particularly if Honolulu were hit directly. If North Korea were to launch a strike on Hawaii, the state would have about 20 minutes to respond. Fox News reports that it would take the state 7 years to prepare for such a disaster, given the 1.42 million person population.